The right garden apparel ... the clothes, headcoverings, gloves, shoes and boots you wear while gardening are important to comfort and sometimes even safety while tending the flowers and plants in your garden areas. From head to toe ... let's take a look at some of the garden apparel you'll be wearing and just what to look for. Overall, you want gardening gear to be comfortable and form-fitting yet not restrictive. This goes for gloves, shirts and pants especially. You'll want to use a garden hat of some sort. Headcovering can be a bucket or wide-brimmed hat, a baseball cap, or a simple visor to keep the sun out of your eyes. If you tend to burn, early in the season, be sure to consider wearing sunscreen to prevent your skin from burning. You'll want to wear a loose fitting comfortable shirt. You may want to keep it tucked into your pants to keep a curious bee from finding its way inside. They sometimes get in and get lost trying to find their way back out. 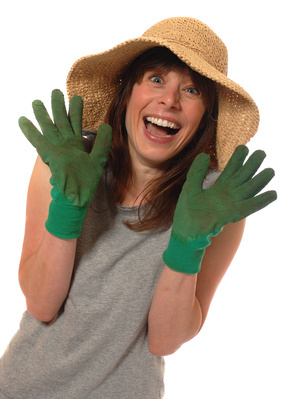 Your garden gloves should fit snugly yet not restrict the movement of your fingers or hands. If you plan to be pruning rose bushes, there are elbow length gauntlet gloves on the market for added protection against those thorny areas. Many styles and fabrics are available. Some include Micro Suede stretch, Nitrile weeding gloves, leathers, deerskins, goatskins, and support gloves. Pants usually get the hardest wear while out in the garden. You'll kneel in them, carry things in the pockets (make sure your pants have good sturdy pockets to hold those pruners you'll be sticking in there), and often you'll use your pants to wipe your dirty or wet hands on, also. Some gardeners like to wear and use a gardener's vest or tool apron with pockets. Others prefer to carry a tool tote with them while out in the garden. Next come the knees. Some gardener's like to wear knee pads, others prefer to use kneelers (some of the colorful gel knee pads provide awesome cushion for your knees), while yet others prefer to use a kneeler/seat. The kneeler/seat is convenient as it also helps gardeners who have difficulty getting back up once they've knelt down. Flip it over and use the sturdy frame to lift and support yourself back to a standing position. Finally we come to the feet. Appropriate garden footwear can help you comfortably enjoy any of your gardening chores. For everyday use, washable garden clogs work great. For heavy-duty use like digging though, you'll want to have a pair of boots handy. Boots with a steel arch help wonderfully well when doing those heavy digging chores you'll need to do from time to time. Remember ... good gardening gear is comfortable and form-fitting yet not restrictive. It helps you get the job done while letting you enjoy being out and about in your gardening areas.